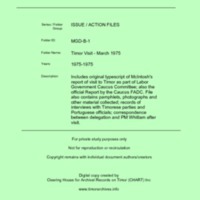 Includes original typescript of McIntosh's report of visit to Timor as part of Labor Government Caucus Committee; also the official Report by the Caucus FADC. File also contains pamphlets, photographs and other material collected; records of interviews with Timorese parties and Portuguese officials; correspondence between delegation and PM Whitlam after visit. “Timor Visit - March 1975 [MGD B1],” CHART DIGITAL, accessed April 18, 2019, http://chart-digital.info/items/show/627.